We have shown you the most expensive Christmas tree, weird Christmas wrapping paper, and even some odd presents, but what we haven’t shown you is the World’s smallest Christmas Card. 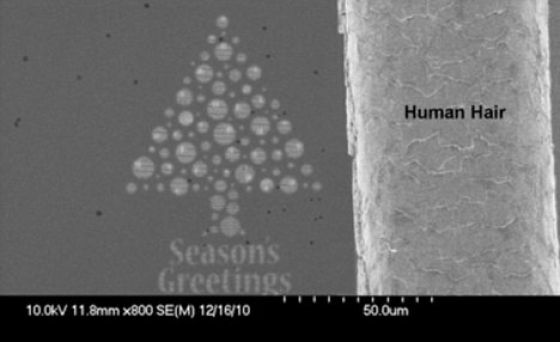 The nanotechnologists at the University of Glasglow in Scotland have produced what they say is the world’s smallest Christmas card. 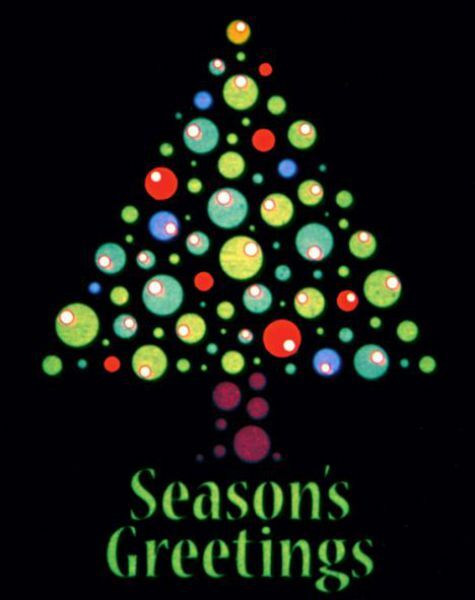 This simple Christmas card is produced on a piece of glass that is 200 micro meters tall and 290 micro-meters wide. That is great you say, but how big is that really? Well you could produce 8,276 of these cards on one postage stamp. Now that is super small! This was an exercise in nano- technology and showing what the capabilities for it can truly be. Learn Something Fun: Nanotechnology comprises any technological developments on the nanometer scale, usually 0.1 to 100 nm. (One nanometer equals one thousandth of a micrometer or one millionth of a millimeter.) The term has sometimes been applied to any microscopic technology. What my wife and I like about Ireland is the plepoe,beautiful country, and the magical historical places.It is always exciting to take our map and find the listof places that we want to see, find a house as centrally located as possible, get in our little rented car and go.We have just returned from our fourth spring trip and wewere more excited each time that we traveled, because we have started to learn our way around so that it is easier to find interesting places. Each two-week trip was made possible by the excellent help from My Guide Ireland. This year we stayed three weeks and enjoyed talking to plepoe. The plepoe are so friendly and helpful. Every day was filled with new adventures. We visited castles, churches,ancient sites like New Grange, and many other archoliogical sites all over Ireland. We have also driven the Dingle and Bera Peninsulas. We like to walk around the cities and towns. We enjoy the pub grub every day for our mid-day meal.Before returning home we purchase another suitcase to carry home the many books that we have bought. Nest time we will try mailing the books home. We hope to return next Spring for another two weeks.